As of late, we have been in slight abundance of herbs. My problem is that parsley is soaking all the sunlight from basil. I haven’t touched lemon thyme all summer and sage keeps getting eaten by bugs. “Tisk, tisk,” you may say. 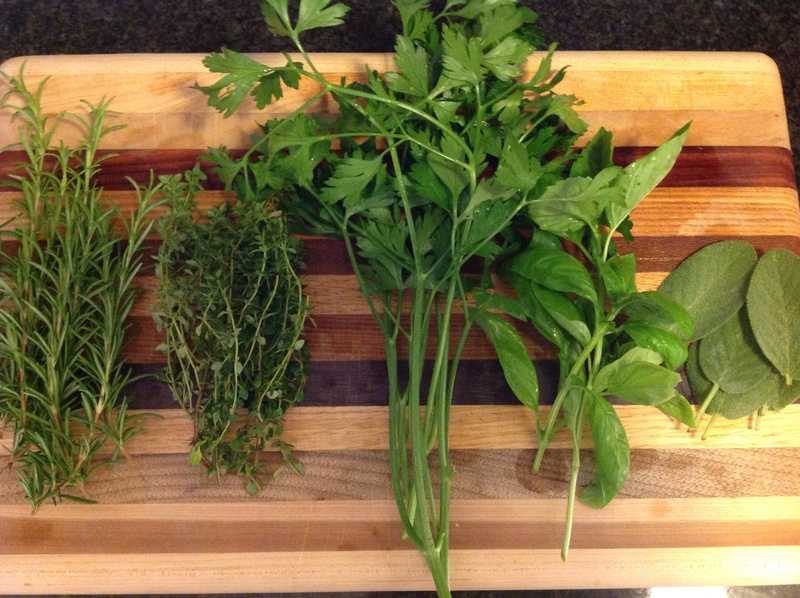 “Use your herbs! Give them away! Harvest them!” Well, I’ve done all of that and I’m still over producing. I came across A New Way to Preserve Herbs on Food52.com. I was encouraged and excited. A new project. I felt like high-fiving angels. Time to get started. The first step is to gather the herbs. My first piece of advice: gather more than you think you need. I had to go back into the garden and grab another bunch to fill my baking sheet. I went a little full throttle with the herb selection (basil, rosemary, parsley, sage and lemon thyme) and in hindsight I wish I would have limited my selection. Food52 suggests parsley, thyme and lemon zest. Second, wash the herbs and dry. At this point, set your oven to the lowest temperature. Next, (this is the sticky part) prep your herbs. When I mean prep, I mean pull them from their stems. 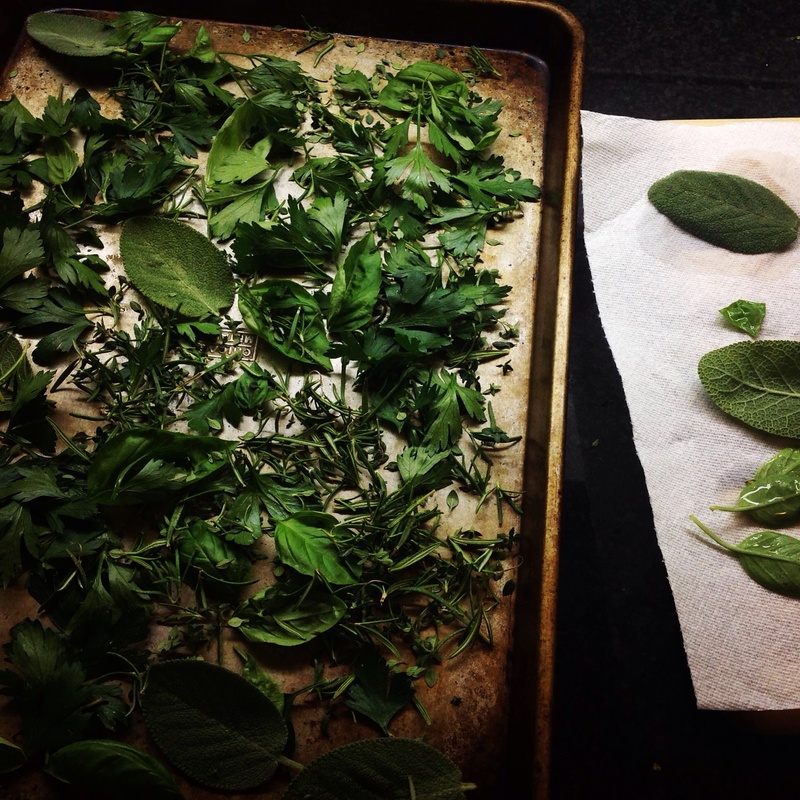 For parsley, basil and sage you literally pull the leaves off. For thyme and rosemary, hold the top of the stem securely with one hand and with your other hand scrape the leaves off starting from the top moving all the way to the bottom. Your paws will smell like Christmas and will be slightly sticky even after a few washings. 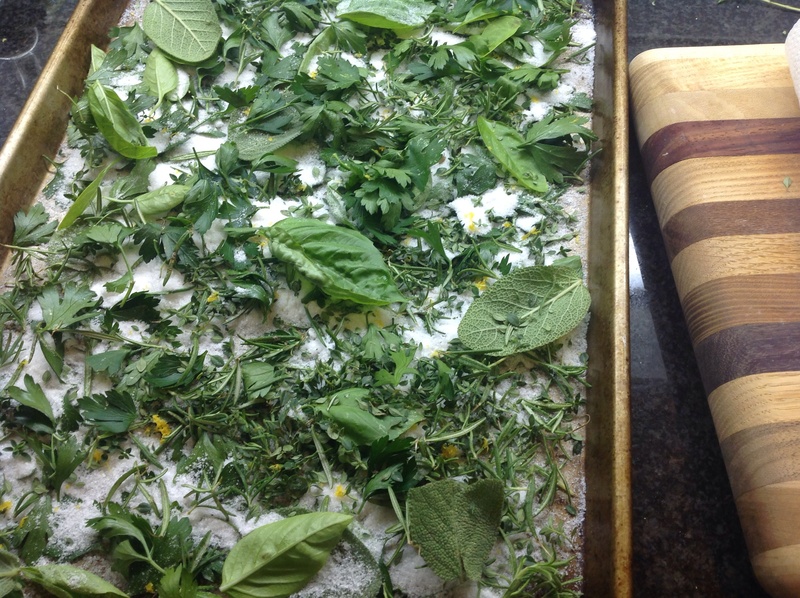 Next, take a large sheet pan and scatter half of the herbs as the bottom layer. 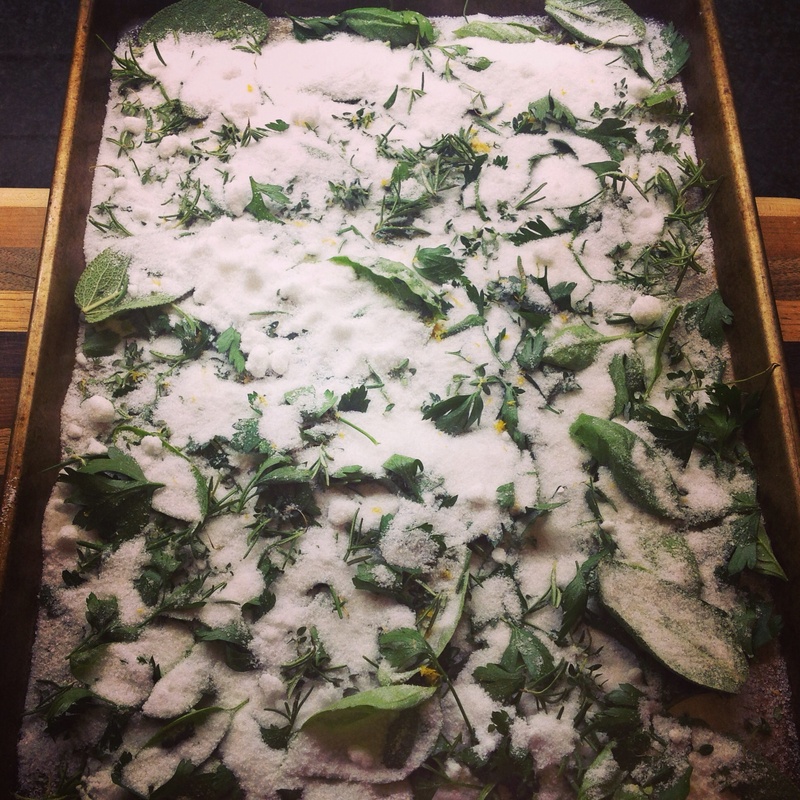 Then douse the herbs with sea salt. Continue this pattern one more time (layer it like lasagna). 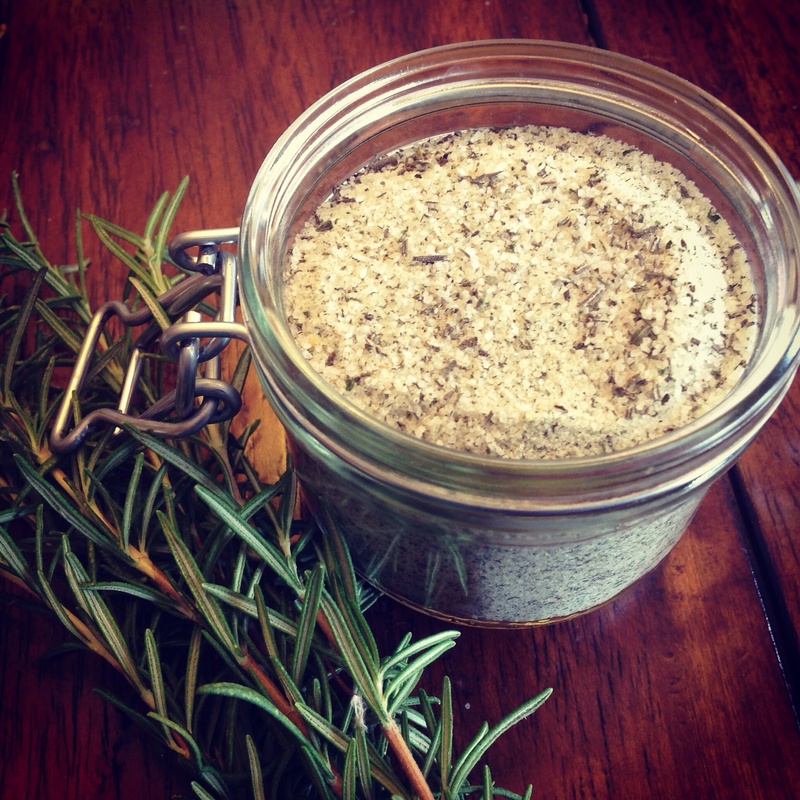 Put the herbs in the oven over night at the lowest temperature available. Wake up and put the overnight result into the food processor. Pulse the mixture until the herbs are finely chopped and well distributed. Now, you have summer with salt.